The 1992 Olympic games instigated a large change beside the traditional Poblenou area that was being renovated and fitted out as a residence for athletes. Previous to the event, this part of the coast consisted of brownfield sites, warehouses and docks. Today however, it's one of the most modern and architecturally grandiose districts of Barcelona. 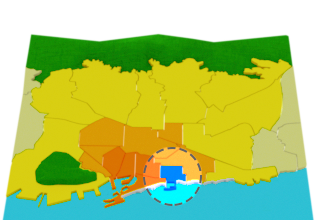 In this article we show you a video in which you'll discover the district of the Olympic Village of the hand of its neighbours. We also tell you the reasons why to stay here, its attractions to visit and the best places to eat and shop. If you're a student you'll also be interested in knowing where are the libraries, green areas and places to practise sports. In this video we show you the different neighbourhoods of Sant Martí: Vila Olímpica, Poble Nou, Sant Marti and Diagonal Mar. Vila Olimpica largely consists of a younger population and thanks to the 1992 Olympics it has become one of the favourite places to live in Barcelona. Why is it so popular? Well that's mainly owed to the the number of parks and the local beach in the zone, as well as the designer apartments and port. Pretty much everything needed to live a life of high standing! 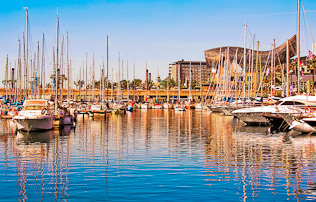 It was also the first official maritime district of Barcelona, built up of the port, marina, large seaside promenade and a selection of restaurants and bars. In contrast to the much more known area of Barceloneta amongst tourists, the apartments here are modern and spacious. Don't hesitate to take a look at our monthly apartments in this area to get an idea of what they are like. The neighbourhood was designed by Josep Martorell, Oriol Bohigas, David Mackay and Albert Puigdomènech. Many of the buildings that make up the area are the work of FAD-award-winning architects. For this fact along you can find a large number of touristic attractions, such as: The Olympic Port, built specifically for the marine and navigational sports during the 1992 Games; Twin Towers (One a Hotel, the other offices); the Ecumenical Centre; the Sports Centre and the Meteorological Centre. The streets, avenues and green zones have been populated with sculptures and peculiar structures like "Fish", the massive 35m design that was commissioned to none other than the world famous architect Frank Gehry and the pergolas (imitations of trees of iron and wood) that proposed Enric Miralles and Carme Pinos in the Icaria avenue. The neighbourhood of Vila Olimpica is being reformed. Many are the artists who decide to make these old factory warehouses their new workshops, lofts and shops. As a result, it's possible to appreciate an alternative environment with very diverse streets. If you're interested in living in this neighbourhood you can already take a look at our selection of student accommodation in Barcelona. In this neighbourhood, you can have a complete student life. Apart from the large Ciutadella park and other green spaces, you have the sea nearby and municipal sports facilities like the centre Esportiu Municipal Nova Icària and the maritime club. You won't have any excuse to avoid staying active. 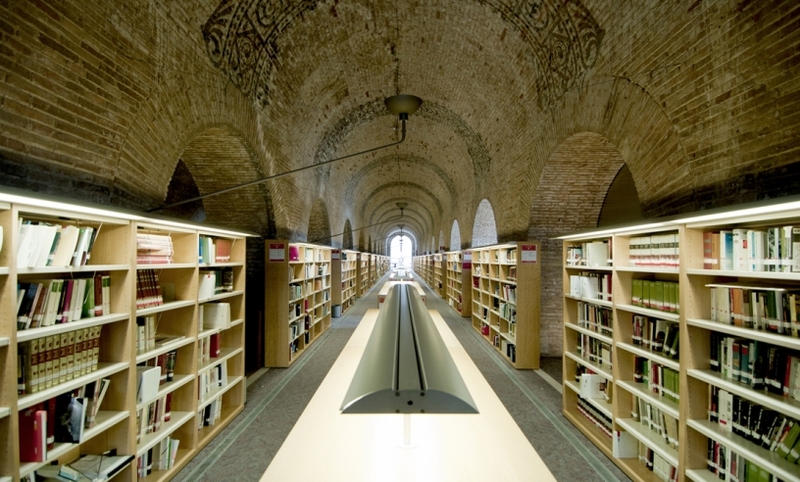 You can also go to study in one of the most beautiful and emblematic libraries in Barcelona, UPF LIbrary, which was a former water deposit for Barcelona. Beside the Olympic Village you can find a large variety of bars with terraces and open-air restaurants, mainly specialising in seafood, tapas and Catalan cuisine. You can enjoy the wonderful views of the sea while sipping on a coffee on the small terraces... But for something completely different; visit Ice Bar Barcelona. The nightlife of the area is super-popular amongst the international community, with visitors flocking to the large number of famous restaurants and nightclubs. There's Shoko, Opium Mar and Baja Beach, all of which sit beside the beach. Those that feel like trying their luck will enjoy risking it all at the Gran Casino of Barcelona that can be found right by the twin towers, more specifically the Hotel Arts. Vila Olimpica also has its very own shopping complex with the same name. The Vila Olimpica Centre consists of restaurants, shops, boutiques, a supermarket and a Cinema with 15 theatres and 2D/3D screenings in English (subtitled in Spanish). Metro Station Ciutadella-Vila Olímpica. This will take you to the city centre in around 10-15 minutes. Tram stations Ciutadella-Vila Olímpica and Wellington. The area also has many Bicing Stations, where you can rent bikes. If you are in the mood for walking though, you can walk to Las Ramblas or the city centre in about 30 minutes. There's always the option of catching a taxi, which regularly can be found driving through the zone as it's close to the city centre. Nova Icària Nova Icària Beach is easily the most family friendly beach in Barcelona. 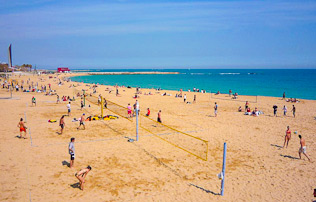 7 Best beach apartments in Barcelona Make the most of sun, sand, and sea, by staying in one of our best Barcelona beach apartments. Outline of the best January events in Barcelona A new year and still lots of events to visit this January in Barcelona. English and original language cinemas in Barcelona Like to watch movies in the original language? See our list of the best cinemas in town! The major festivals of Barcelona's neighbourhoods Music, Catalan culture, family activities, celebrations... Discover the major festivals of Barcelona!